The scheme followed the scrapping of fuel and bread subsidies, and provided for a monthly income of $45 to compensate for the ensuing higher prices. The payment was originally intended to be means tested and only available to the poor, but it was subsequently made universal when the Iranian government decided means testing would be impractical. The payment was around 29% of median household income, and at the time the transfers were worth 6.5% of national GDP. The payment was not designed to alleviate poverty, and it is unpopular with many middle-class Iranians and the current Rouhani administration (who inherited it from the government led by Mahmoud Ahmadinejad). The primary criticism of the scheme is that it is alleged that it has a disincentive effect on the labour supply for poorer workers, i.e. the poor no longer feel the need to work because of the payments that they are now receiving. For example, this Al-Monitor article alleges that between 0.5m and 0.7m agriculture jobs were lost because of the payments and rising energy prices. The introduction of the universal payment coincided with the tightening of sanctions against Iran by the international community, which had a negative impact on the overall Iranian economy. Despite this, the years following the introduction of the payment saw a dramatic reduction in extreme poverty, a decrease in economic inequality, and a sharp increase in tertiary education registration. 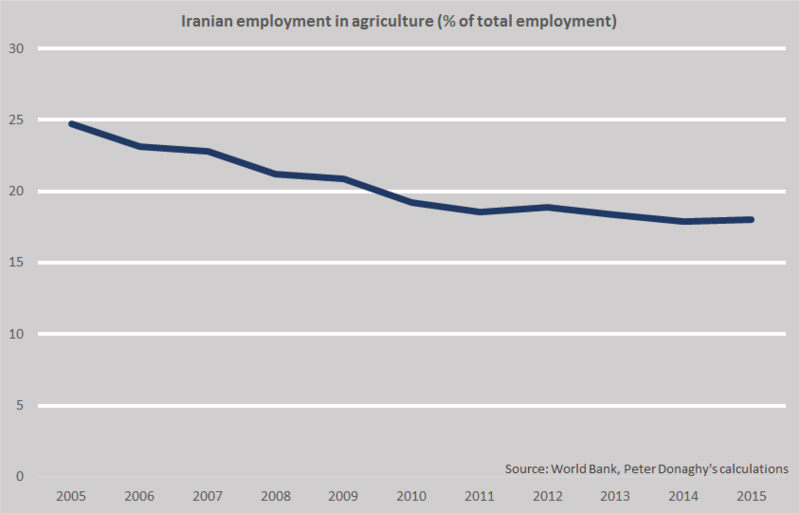 There is scant evidence that poor Iranians dropped out of the labour market altogether as a result of the payment. Data provided by the World Bank shows that the Labour force participation rate did indeed drop following the introduction of the payment in 2011, but that this drop was temporary. By 2015, the latest year for which data is available, the percentage of the population in the labour force had returned to 2010 levels (the dashed line shows extrapolated data for years where no data was available). The suggestion that there was a fall in the percentage of the population employed in the agricultural sector following the introduction of a de facto universal basic income is not borne out by the data. There was a noticeable fall in agricultural employment as a percentage of the overall workforce in the period before 2011, but since then it has largely flatlined. The introduction of the payment also had the effect of reducing inequality. The Gini coefficient, which represents the extent to which wealth is distributed in an economy equally, fell from 42 in 2009 to 37.35 in 2014. This means that Iran was one of a small handful of countries to reduce inequality to a noticeable extent in the years following the global financial crisis. Only Moldova (from 34.7 in 2008 to 26.7 in 2014) and Iceland (31.9 in 2008 to 26.9 in 2012) have seen Gini coefficients fall by a larger amount over this period. Extreme poverty, as defined by the percentage of the population earning less than $1.90 a day, was almost eliminated, falling from 2.6% in 2005 to 0.08% in 2013. The strongest clue that the introduction of a universal income has led to an increase in human capital formation (and not an increase in idleness) can be seen in the tertiary education enrolment rates. 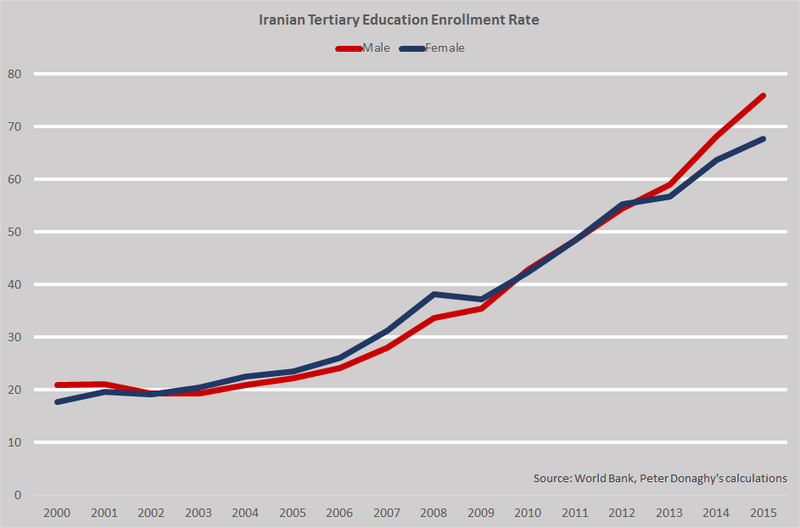 Whilst the proportion of university age Iranians enrolled in tertiary education had been rising steadily since the turn of the millennium, there was a marked jump in 2011 following the introduction of the payments. The female university enrolment rate has increased from 42% in 2010 to 68% in 2015 (the equivalent figure in the UK is 64%). The percentage of the university aged male population enrolled at university is 76%, up from 43% in 2010 (by comparison, the rate in the UK is 49%). Whilst it impossible to attribute all the advances in reducing inequality and increasing university attendance to the introduction of the universal basic income in Iran, the Iranian experience does suggest that a universal basic income would not necessarily lead to a permanently lower labour participation rate. It also suggests that it can be effective in alleviating severe poverty and reducing inequality, even given a contracting overall economy.